When planning a Christmas party, there are so many things to consider. What type of theme will you have, what foods will you serve, what activities do you want to include…and the list goes on! 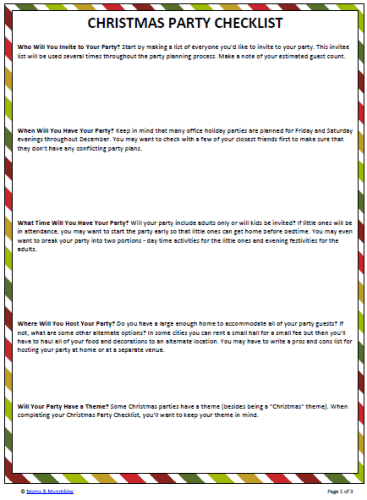 This Christmas Party Checklist is designed to help remind you of all the items you need to consider when planning your party. It also comes in a free printable format that you can write notes on. Who Will You Invite to Your Party? Start by making a list of everyone you’d like to invite to your party. This invitee list will be used several times throughout the party planning process. Make a note of your estimated guest count on the Christmas Party Checklist. When Will You Have Your Party? One of the first steps on your Christmas Party Checklist is deciding when you want to have the party. Keep in mind that many office holiday parties are planned for Friday and Saturday evenings throughout December. You may want to check with a few of your closest friends first to make sure that they don’t have any conflicting party plans. What Time Will You Have Your Party? Will your party include adults only or will kids be invited? If little ones will be in attendance, you may want to start the party early so that little ones can get home before bedtime. You may even want to break your party into two portions – day time activities for the little ones and evening festivities for the adults. Where Will You Host Your Party? Do you have a large enough home to accommodate all of your party guests? If not, what are some other alternate options? In some cities you can rent a small hall for a small fee but then you’ll have to haul all of your food and decorations to an alternate location. You may have to write a pros and cons list for hosting your party at home or at a separate venue. Ugly Sweater Party: Guests are invited to wear their ugliness Christmas sweaters in hopes of winning a fun prize. Tree Ornament Party: Each guest is invited to bring a decoration for your tree. You could award prizes for the largest decoration, the smallest decoration, the most original, etc. Baking Exchange: This party is popular with women who love to bake and would like to stock their freezer with holiday goodies. Each guest is asked to bring a couple dozen of their favorite cookie/square recipe. Then each guest swaps treats at the party and goes home with a wide variety to enjoy during the holiday season. Donations: Rather than exchange gifts at a Christmas party, some hosts invite guests to bring a small donation for a local charity like toys for kids, food for the Food Bank or food for the local animal shelter. White Elephant Gift Exchange: Guests are asked to bring one small wrapped gift (usually of a set dollar amount). A game is then played where you can choose to open a new gift or “steal” a gift that a previous guest has already opened. Open House: This party is a bit less scheduled than others. Guests are simply given a time frame of when they can stop in to share some holiday cheer. Guests come and go to the party within the set time frame. This may be an ideal party for those who don’t have a large enough home to fit all of the guests in at once. Crafting Party: This is a fun idea for friends who like crafts. You could invite over a few of your friends to share some holiday treats and drinks while creating holiday crafts together like making a wreath. You’ll want to send each guest a list of supplies to bring with them to the party. Holiday Card Party: Many of us get bored while addressing the many envelopes of holiday cards that we send each year. A fun idea is to gather your best friends & their holiday cards and make a party out of it. You can share holiday treats, drinks and stories while addressing those holiday card envelopes. How Will You Invite Guests to the Party? Will you use electronic invitations or paper invites? You’ll want to send these out a few weeks before the party so guests can plan ahead. Make sure you give guests a contact method for RSVP. If you’ll be planning a special theme or dress code for the party, be sure to include this information on the invitation as well. Make notes on your Christmas Party Checklist for guests who have responded with their attendance. What Food Will You Serve? Are there any known allergies that you need to be aware of? Be sure to note these on your Christmas Party Checklist so you don’t forget! Will you be serving appetizers only? Desserts? Chickabug has a great printable to use as a guide for knowing how much food to make to serve your guests. If you’d like to try some new recipes without doing all of the food preparation yourself, perhaps you want to arrange for a potluck where guest volunteers are asked to bring dishes to share at the party. You’ll also need to think of what dishes, utensils, napkins and cups you’ll use at the party. What Drinks Will You Serve? Will you be serving alcohol at your party? Do you want to make special arrangements for getting guests home safely? Perhaps asking guests to volunteer to be designated drivers? How Will You Decorate Your Party? My favorite holiday decorations are lights – lots of lights! Think about how you’ll want to decorate your party and where you can pick up supplies. If you need to do some holiday decoration shopping, make note of this on the Christmas Party Checklist. How Will You Clean Up After the Party? You’ll want to have an area set up that guests can use for their trash and recycling. What Type of Entertainment Will You Plan? Will you be playing Christmas songs on a stereo in the background? Are you planning some fun Christmas games (visit our Holiday Fun Page and scroll to the bottom to the Christmas section for a listing of all our fun & free printable games)? On your Christmas Party Checklist, make note of the games you’ll play and what supplies you’ll need for each game. How Will You Welcome Guests to The Party? Where will guests leave their coats and shoes? Do you want them to enter through a side door? Will You Be Sending Guests Home With a Party Favor? Do you plan on sending guests home with a small treat? You’ll want to think of an area you can display these so you won’t forget to give guests their treat when they leave the party. 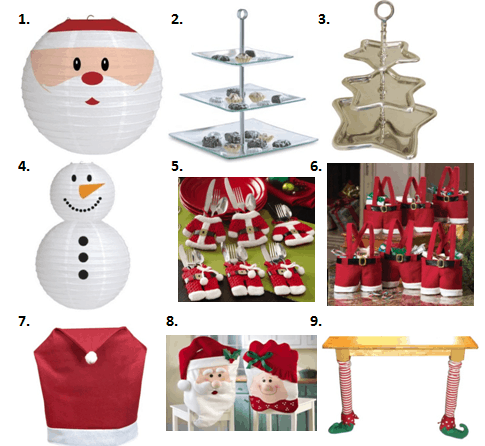 What other items can you think of to include on a Christmas Party Checklist? Stay updated on the latest freebies and ideas for holiday fun by following along on Facebook, Twitter, Pinterest and Bloglovin’. This is a great list Cheryl!! So helpful. The holiday card party is brilliant, I’m going to have to remember that one for next year!